“A great statesman is the product of heredity, endowment, education, and the times. 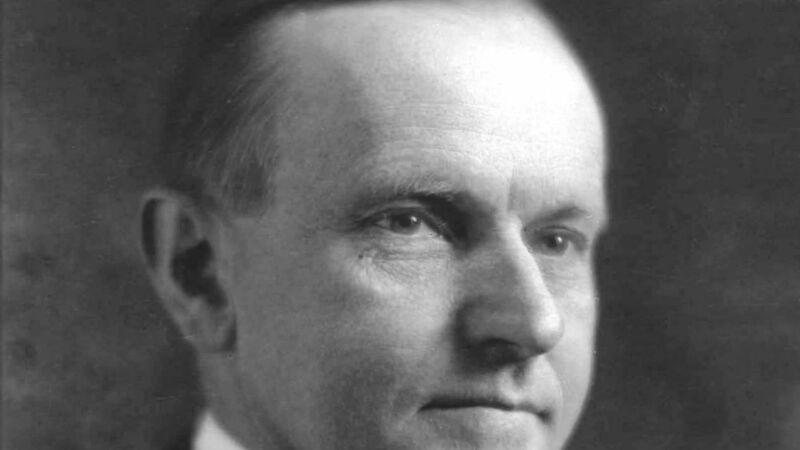 Mr. Coolidge was the son of generations inured to toil and discipline amid the mute eloquence of mountain and valley, inspired by the strength and beauty of nature, trained by association with the keen-witted, honest, industrious inhabitants of the sparsely settled country. He typified the characteristics of the race from which he sprang. He was not given to emotion. He was shy. His path was steep; it could be scaled only by unyielding determination. In no small measure he had clearness of perception, retentiveness of memory, soundness of judgment. He applied these faculties with the greatest perseverance to whatever required his attention. Industry was his early training. It grew with his years. Thrift was the habit of his life. It was applied not alone to material affairs but to time, speech, energy. His intellectual resources were directed unwaveringly but without waste to the accomplishment of his main aims. He was not infrequently termed ‘silent.’ This was one aspect of the shrewdness of his nature. No one understood better than he that the unspoken thought never wounds, never harms, never needs to be modified or withdrawn. When speech was required, he never failed. His tastes and manner of living were simple. Many examples of his keen and kindly wit found their way into the common knowledge of his countrymen. “The years of the twentieth century preceding his Presidency had seen much political agitation and change and had witnessed the upheaval of the Great War and the disillusionment following its close. The country needed an opportunity to readjust itself. The people wanted to attend to their own affairs. They were reassured to know that in the office of President was a man of rugged honesty, calmness, wisdom; who was reticent, modest, courageous, experienced; to whom no duty was trifling or obscure; who had broad sympathy and deep understanding of his fellow men. The depth and breadth of his nature, the acuteness of his mind, the soundness of his moral purpose, the resources of his wisdom were sufficient for every day and for any emergency. His capacity, his temperament, industry, simplicity were adapted to the times and to the work to be done. “The people responded to his ability to discern their thoughts and needs. They looked to him, not for new and startling theories of government, economics, or politics but for expression of their inmost spiritual longings and aspirations. They were not disappointed. They could understand him. They thought of him as one of their own kin. They bestowed on him in steadily increasing measure deep, constant, unshaken confidence. They paid most illustrious honor, not so much to what he had done but to what he was. They showed thorough appreciation of his noble character. He was the incarnation of the ideal of the America of his day. We miss you, Mr. Coolidge. America needs the example of your character and strength of your wisdom again.